Everton vs. Chelsea : 12 March 2016. It seems to be all about away games at the moment. Whereas home matches at an increasingly sterile Stamford Bridge are continuing to lose their appeal, trips to various away stadia still manage to thrill me. After trips to Southampton and Norwich, here was another classic Chelsea Away Day. Our FA Cup Quarter Final against Everton had all the hallmarks of a very memorable day out in support of The Great Unpredictables. There was an invading army of six thousand and we were planning on making a day of it. I collected the usual suspects; first PD, then Glenn, then Parky. The Fab Four were heading to Merseyside in The Chuckle Bus. As we headed north, the weather was magnificent – blue skies – and the day stretched out in front of us, expectant with moments to treasure. We were loving the buzz of it all. Six thousand supporters. It was some number, yet there would be similarly large away supports at Old Trafford and The Emirates on Sunday too. Whereas league allocations are always locked at 3,000, at least domestic cup games can evoke times past when away supporters would often travel up to 10,000 strong for league games. For this, I am grateful for the FA Cup. There is nothing better than being in a strange town, and being able to support the club in such numbers. At Chelsea, we love the FA Cup. Although my ticket was marked £35, Everton had taken the decision to only charge Chelsea £30 for season ticket holders, to mirror the price they had charged their own season ticket holders; a fine gesture. Additionally, Chelsea had taken an additional £10 off all tickets. My ticket therefore only worked out at £20 plus a £1.50 booking fee. £21.50 for a Cup quarter final. Of course, there has been a lot of talk in the media about the £30 cap on away tickets to be phased in over the next few seasons. This has been met with unilateral approval; without a substantial number of away fans acting as a catalyst to generate noise from home fans, the atmosphere at games in 2016 would be dead. Although the Football Supporters’ Federation has been campaigning for a few seasons for a “Twenty Is Plenty” limit, one wonders if the sight of ten thousand Liverpool supporters leaving en masse a month or so ago was the tipping point. After Birmingham, the skies became full of cloud, but there was no rain, thankfully. As we continued to head further north, we replayed Parky’s mix of Northern Soul which served the four of us so well on the trip to Old Trafford just after Christmas. Just before we passed over the Manchester Ship Canal, I commented to the boys that we had not seen a single Chelsea car, which surprised us all. Then, within a few minutes, my mate Andy passed us. Onto the M62 and the excitement was rising. I headed in to town, down the hill past the huge red brick cathedral, and I was parked-up at the Albert Dock at around 1.45pm. This mirrored the pre-match that Parky and I enjoyed last season prior to our surreal 6-3 win at Goodison. We headed in for a drink at a very busy “Pan Am Bar”, as in 2014. It was crowded, and ridiculously warm. We spun out for a little walk around the Albert Dock, and I found out from Glenn that his grandfather – like my father – had undergone his RAF training at nearby West Kirby on The Wirral. Before our game at Goodison in 2012, Parky and myself had paid it a visit. We then popped into “Vinea”, a wine bar overlooking the dock. This was all very pleasant. Our party was joined by Kev, down from Edinburgh for the day, and newly arrived from Lime Street. I ordered pints of “Warsteiner” and awaited for the next guests to arrive. My friend Kim, visiting from Florida, arrived with her friend Eddie, who – apart from being an avid football fan, like us all – plays guitar in China Crisis, a band who I loved back in the ‘eighties, and who still tour to this day. I saw China Crisis just after I came back from Tel Aviv in November. The song “African And White” had a certain resonance that night. It was a fantastic gig. Kim – who has been working with the band recently – introduced me to Eddie after, and it was a pleasure to see them both once more. Fate and ridiculous coincidence seem to play an increasingly large role in my life these days. Before the home game with Arsenal in the autumn, I had flippantly thrown the phrase “flaunt the imperfection” into a conversation with my mate Daryl – I forget the context – and Daryl immediately knew that I was referencing a China Crisis album. For a few minutes, we chatted in The Goose beer garden about the band. I had three of their albums; I was a fan and so was Daryl. He had seen them years ago in London. Lo and behold, I briefly mentioned this in my match report a few days after. One or two weeks later, I was chatting to Kim, and I remembered that she had seen China Crisis in concert recently. I wondered if she had read my Arsenal match report and had spotted my brief comment about the band; she hadn’t so I decided to send Kim the link. At this point, I was completely unaware that Kim was friends with the band. Imagine my surprise when Kim informed me that she was with Eddie at that very match. Football and music, football and music, football and music. For an hour, we were able to relax, old and new friends together, and talk about these two great passions of ours. Kim was especially keen to hear how the five of us had all met. Of course, Glenn and I go back to 1977. It’s a lifetime of friendship. I met PD on a train back from Cardiff City in 1984. I met Parky at work in 2000. I met Kev for the first time in Lisbon last season. Eddie, although a Liverpool a season ticket holder for thirty years – the old Kemlyn Road, now the Centenary Stand – was enjoying our tales of friendship and fandom. We spoke about games that we had both attended; the two games in 1986 at Stamford Bridge, Kerry getting injured in the FA Cup tie on a Sunday, then Kenny scoring the championship clincher in May. 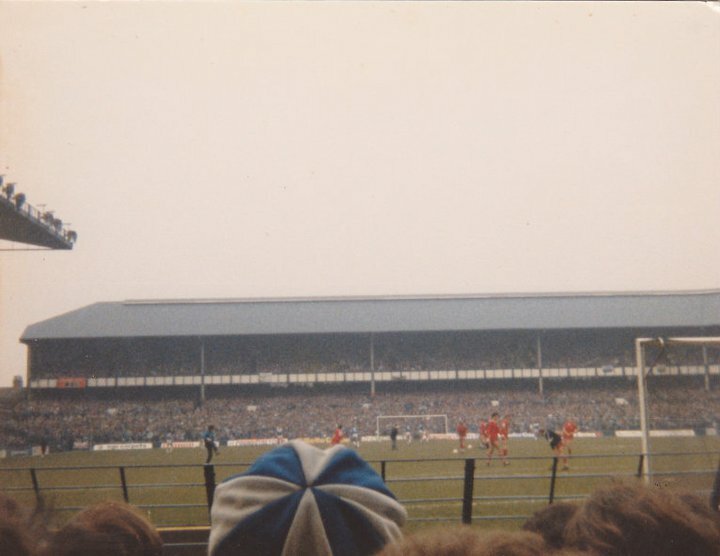 We spoke of ticket prices, the Liverpool protest on 77 minutes recently, and we occasionally spoke about the antipathy between the two sets of fans. He was at Heysel and Hillsborough, and he shared a few harrowing tales from those two days. Heysel distressed him so much, that he has not traveled in Europe with his team since. I told him about my friend Mario, Juventus, having a ticket, but not travelling to the game due to an overload of school work that week. Incredibly, Eddie told me that the very first time that he had heard about the deaths at Heysel was when he was back at the airport before catching a flight back to the USA. I found that staggering. These days, the news would be all around the world in seconds. Eddie was particularly fearful of Everton, with new backers, enjoying an imminent period of dominance in the city. Despite our different allegiances, we were getting on fine. There was limited talk about the upcoming game, though all of us were confident that we could prevail against a typically hot and cold Everton team, whose supporters were starting to turn against the manager Martinez. We were subconsciously dreaming of a Wembley semi-final. But maybe that was just wishful drinking. Kev and the boys were talking about further away games at Bournemouth and Liverpool. We might be having a poor season, but these away days are still to be treasured. Eddie spoke to Parky, the Chuckle Bus’ resident DJ, about music, sampling, and a few other related topics. Somewhere over the hill, past Everton and Anfield and Stanley Park, a game of football would be taking place very soon, but we were enjoying the chance to be together and talk – and laugh, there is always laughter – about football. Sadly, we had to move on. Kim and Eddie set off to hunt down a cab, before taking their places in the lower tier of the Bullens Road stand at Goodison in the Chelsea seats. I drove up the hill towards the cranes at Anfield and found a very convenient place to park. This was indeed a cheap day out. 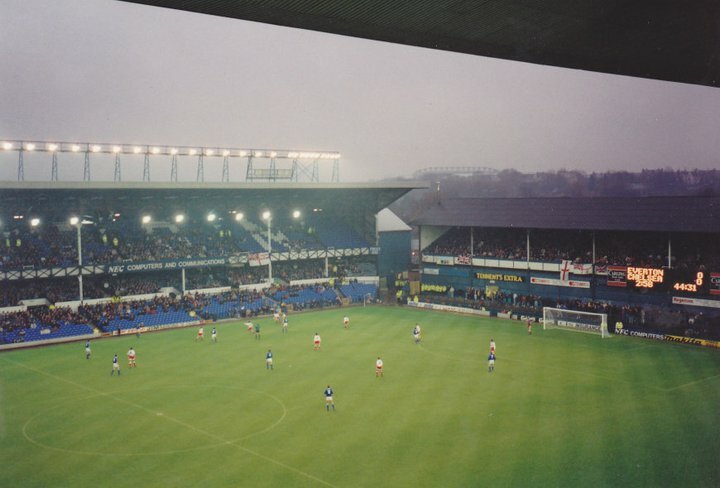 The walk towards Goodison brought back memories of my first couple of visits in 1986. We arrived with about twenty minutes to kick-off. I was looking forward to be able to watch the game, for once, without being stuck in the corner, and usually behind the goal line. By a strange quirk of fate, my seat in row P was directly in front of Glenn and PD. Things were decidedly cramped in the rear rows of the upper tier, with little leg room among the tight wooden seats. Not that anyone was sitting of course. Everyone among the six thousand strong travelling army of Chelsea supporters was standing. I suppose that the split was 60% / 40% with most in the lower tier below. We had heard that the club had decorated each of the 6,000 seats with a Chelsea scarf; a nice touch. And there they were, neatly draped over the seat-backs. Maybe the club expected us to hold them aloft, “YNWA”-style, to wind up the Everton fans. …mmm, that was never going to happen. So, there we were, perched at the top of the antiquated Bullens Road stand, loathed by some but loved by me, almost on the halfway line, with the haphazard struts and supports of the TV gantry blocking our view of the grand old main stand opposite. Alan and Gary were in the same row, but a few seats along. Their trip to Goodison, on the club coach, was free in lieu of them arriving late at Norwich City last week. The six thousand Chelsea fans were in fine voice. Away to my right, the classic and old-fashioned Gwladys Street Stand was packed full of Evertonians. I love the way that the Leitch balcony has been left alone, bare, with no advertisements, and no hindrances. I love the way that the stand bleeds into the Bullens Road. As the teams entered the pitch, I couldn’t even hear the “Z Cars” theme tune. This felt like a proper cup tie, a proper game of football, a proper football stadium. What followed was a proper let down. Our team looked good on paper. Hazard was out, but some would argue that might be a blessing. At least we had Diego Costa, recovered from the PSG game, to lead the line. If he was playing, we would always have a chance of scoring. We were in all white and attacked the Gwladys Street in the first-half. A shot from Tom Cleverley was easily claimed by Thibaut early on, and I wondered if that early shot might set the scene. It was such a poor first-half and I can barely recall more than three efforts on the Everton goal. An early effort from Kenedy flew over the bar. There was a Willian effort, charged down by a defender before it had travelled more than a few yards, and there was a free-kick from the same player right at the end of the half, which Robles tipped over. Apart from those two efforts, it was a football desert. As I kept looking up at the BBC commentator – Guy Mowbray? – I wondered what on Earth he had to talk about. We enjoyed a fair amount of the ball, but just looked so bloody lethargic. Amid all of this, tackles were being ignored on one hand by Oliver, then punished with little rhyme or reason. It was a niggly game of football. The support in the upper tier quietened a little. No doubt they were still roaring downstairs, but I could not hear them. The most disappointing aspect for me was our lack of movement off the ball. It was so frustrating. I urged Pedro on. 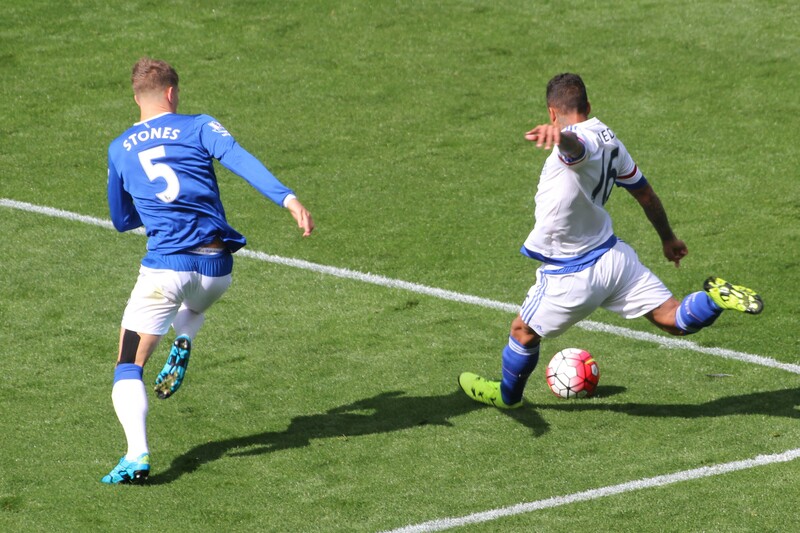 At that moment – he must have heard me – he spun away from his marker into space and Fabregas played in a lovely ball. Sadly, he overrun the ball and the move petered out. Everton hardly caused us any real danger, despite Ross Barkley parading the central area with a fine touch. An errant header from Lukaku was the only effort of note. I wondered what the watching millions at home were thinking. After the half-time break, in which a racehorse was bizarrely paraded around the perimeter of the pitch – “and I thought I had a long face” – Everton began the brighter, with a Funes Mori header flying over from a corner. Gary Cahill, after his Parisian walkabout on Wednesday, tackled Lukaku in a danger area with superb timing and composure. As the game continued, the support grew weaker. Everton were quiet too. The game needed a spark. I lost count of the number of times that Matic advanced, taking too many touches, before playing a safe ball square. I lost count of the number of times Pedro cut back on himself. Fabregas offered little. And Everton hardly shone. Lukaku, the threat, seemed to be well marshalled by our central pairing. Just before the hour, at last a good ball from Cesc found Diego Costa, who did ever so well to hone in on goal, and although he was forced wide, he managed to get a shot in on goal from a ridiculously acute angle. We were sure he had scored. The ball slowly ran across the goal line, virtually all six yards of it, but did not cross the line. Oscar came on for a quiet Willian. We still struggled to break through. A few crosses from Pedro were not met by any threat from our attacking players. Oh for a Drogba or a Dixon. Our unwillingness to shoot really gets me. It eats away at me. Why don’t we do it? Why are we so scared to put our laces through the ball and to cause chaos in opposition defences? It was the substitute Oscar who tamely lost possession in our attacking third, and we then watched – aghast – as the ball was worked out to Lukaku. With a deceptive turn of pace, he swept inside past Azpilicueta, Mikel, Cahill, Ivanovic, Terry, Desailly, Pates, Harris, McLaughlin, Hinton, Dempsey, Carvalho, Droy, Clarke, Elliot, Thome, Hogh, Wicks, Duberry, Sinclair, Leboeuf and Alex to strike a fine shot past Courtois. There were just over ten minutes left and we were heading out of the cup. At last the Evertonians made some noise. Four minutes later, with our defence flat footed and half-asleep, Barry played in that man Lukaku again, and his low shot thundered past Courtois. 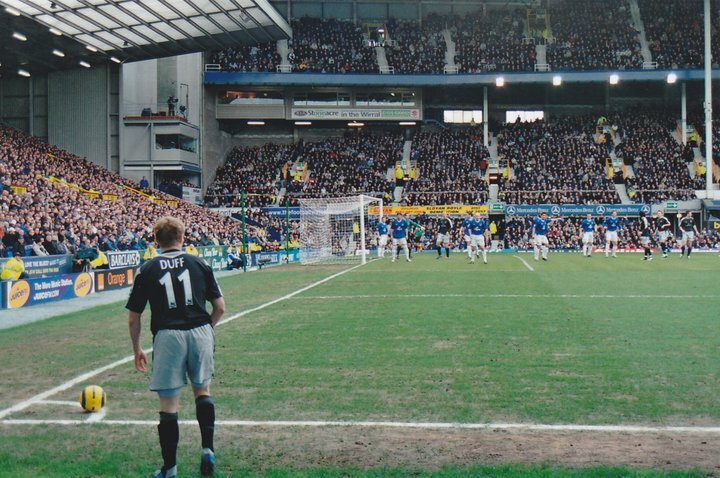 The Gwladys Street were bumping now, making absolutely tons of noise. Although I was silent, annoyed, hurt, I had to admit that it was an impressive sight. Over on the far side, after a flare up, I saw Diego Costa nudge his head against an Everton player. He had to go. A second yellow was waved towards Costa, quickly followed by a red. A few Chelsea began to leave. Barry then was yellow carded for a silly challenge on Fabregas and was sent off for this second caution. The forlorn figure of John Terry replaced Kenedy and played upfront for the final eight minutes. At the end of the game, only four or five Chelsea players had the balls to come over and thank the travelling away support for our efforts. John Terry looked close to tears. Fabregas and Azpilicueta looked dejected. I knew how they felt. Whereas we had to hold our hands up on Wednesday against PSG and admit that the better team had won, this game was so much more damning. We hadn’t been up for the fight. Hardly any player did well. It was a tragedy. It was a mystery. A few youths had an impromptu “set to” on the main road – one lad was punched to the floor – but it soon died down. We walked, slowly on. I found myself walking next to an elderly Evertonian couple – “I mean we’ve been coming here since 1959” – and I wished them well at Wembley. This was met with smiles and a word of thanks. Sometimes, I truly wonder if I watch the same game as others. It was a poor game and we were a poor team. We said our goodbyes to Kev, and then edged out of the terraced streets of Anfield. We stopped oft for a pint in one pub and then a curry in an Indian restaurant, just outside the city, near the rugby league towns of St. Helens, Widnes and Warrington. We had the briefest of post mortems over poppadums, pickles and pints. Then, the long drive home. The first signpost on the approach road of the southbound M6 always puts a shudder in to me after an away game in Liverpool. “Birmingham 96 miles” – not even bloody half way. While others dozed, I listened to music, music, music. I reached home at 1.30am.